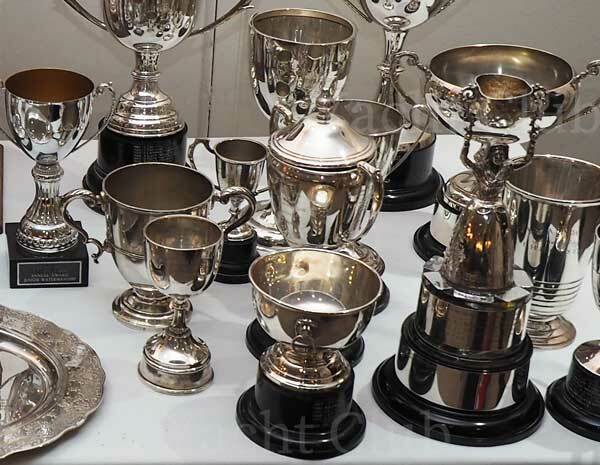 All these Club Member awards are announced and presented at the End of Season Dinner. Some of the awards are for boat-handling competitions. Click here to see the definitions and history of our competitions. Donated by P.Frank Pooley, Commodore of the Club 1960. Best Boat and Crew at Sail Past, judged by flag officers and President. Best First-Timer Cruising the Tideway to the Sea Reach Channel / RiverMedway. Recommended by Flag officers on the cruise and cruise organiser. Round an island on the non-tidal Thames fixed throttle competition – 1st place. awarded on judged competition result. Donated by Lt. Comdr. H.M. Pinnell. Round an island on the non-tidal Thames fixed throttle competition – 2nd place. Round an island on the non-tidal Thames fixed throttle competition - 3rd place. Donated by Lt. Comdr.Charles Barber, MBE, RNVR. Tideway 1st placeawarded on judged competition result. Donated by Leonard and Bodil Cowling 1980. Tideway 2nd place awarded on judged competition result. Donated by Michael Shefras in 1974. Best boat at Charity Children's Day. Awarded by the Hon. Sec., Commodore and representative from the Charity. Donated by L.H. Brooks in 1975. Family Watermanship 1st place, awarded on judged competition result. Donated by Geoff Latter, 1979. Family Watermanship 2nd place, awarded on judged competition result. Couples Cup competition 1st place, awarded on judged result.. Couples Cup competition 2nd place, awarded on judged result..
Veteran’s Cup 1st place awarded on judged competition result. Veteran’s Cup 2nd place awarded on judged competition result. Donated in 1949 by J.C. Dudgeon,Commodore of the Club, whose house name was Deepwater ! Award for contribution to tidal summer cruise. Donated in 1964 by Richard Felmingham, Commodore of the Club. Award for contribution to non-tidal summer cruise. Donated by Leslie Westbrook, Commodore of the Club 1971. Senior Watermanship 1st place, awarded on judged competition result. Senior Watermanship 2nd place, awarded on judged competition result. Senior Watermanship 3rd place, awarded on judged competition result. Best 1st-time entry in any club competitive boating event. Donated by Mark Warner, 1980. 1st place Jubilee Cup, awarded on judged competition result. Donated by Harry Brown in 1981. 2nd place Jubilee Cup, awarded on judged competition result. Member who has boated well in the year, awarded by the Competitions and Cruising Committee. Awarded by the Managing Committee to someone who has achieved a humorous boating event. Awarded by the Commodore to a member, not on the committee, who has worked hard during the Commodore’s year. Awarded by the Commodore to a Committee member who has worked hard during the Commodore’s year. Young person who has shown promise. Donated in 1962 by T. Dilks, Commodore of the Club 1961. Perpetual trophy first presented in 1954 by the North Sea Yacht Club, Ostend. (Prior 2019 this award was for Visitors Seniors Trophy (re-designated 1974 to Victor Ludoram)). Junior Watermanship 1st, awarded on judged competition result. Junior Watermanship under 9 years old, awarded on judged competition result. Donated by Hon. Secretary Derek Prentice in 2018, Commodore of the Club 2014. Award for sustained commitment to the Club's ethos of Channel Cruising. Recommendation by the Competitions and Cruising Committee. Best achievement on the RYA Yachtmaster Course. Awarded by the Yachtmaster Instructor and School Principle. Awarded by the Day Skipper Instructor and School Principle.